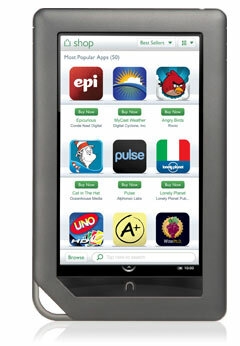 My dear husband bought himself a Nook and this evening we went for Nook training at the Lakewood Barnes & Noble. No, really. It is a darling little machine and the training was good. While I enjoy print books, I have no problem with ebooks and appreciate that I can order most books and have them in hand (as it were) in the matter of minutes. And I love that I can save space and perhaps even let some of my secondary books move on to a new home. This entry was posted in Books (Libraries and Bookstores), Lakewood, WA State - Pierce County and tagged Barnes and Noble, books, Lakewood, Nook, reading on May 4, 2011 by admin.